It's Christine with a quick post on "Adding interest by irritation." We all know that: we create a card and while we're working on it (or even before we start) we try to find the right placement for all the elements. One of the most important elements (for me) is the sentiment. The sentiment decides if people start thinking, giggling, smiling,...(insert any reaction here) and it's important that the sentiment goes well with all the elements on the card, especially if you use punny sentiments. 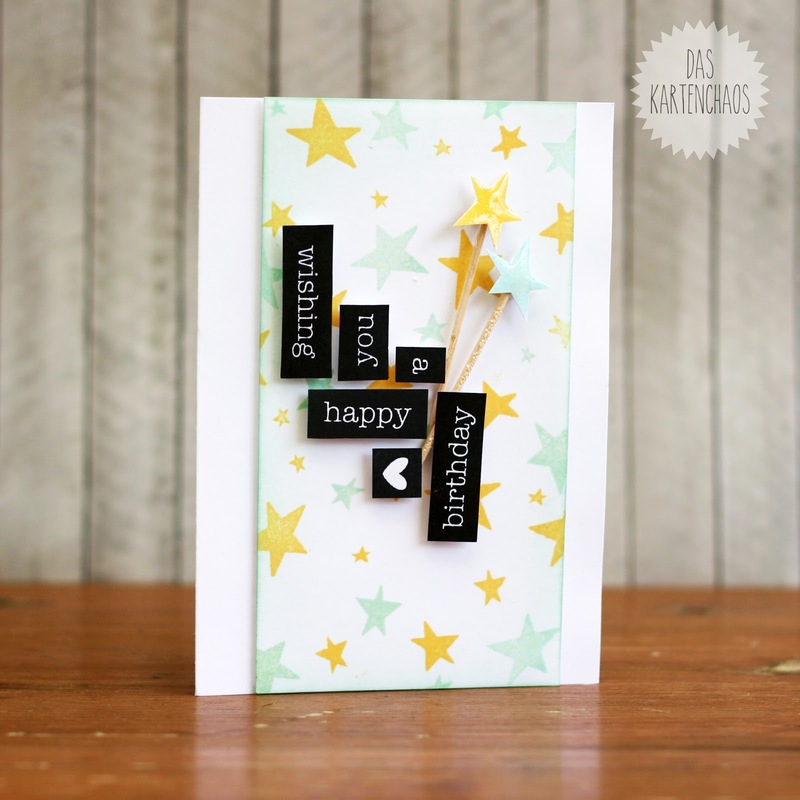 There are many sentiments that work on nearly every card, such as birthday sentiments. So if you want to make those sentiments special and make people focus on them you want to add some interest. You can do that by painting a focal point as a backdrop for your sentiment (like Joni Andaya did in this post) or keeping the rest of the card pretty simple (like Danielle did here). You could also use embellishments to draw the eye to your sentiment. But one other way to add interest to your sentiment is: Make it unusual - irritate the eye. I think this makes the sentiment more interesting and adds something "special" to the card. I also added some embellishments, that I created with the stamps. I stamped the stars, cut them out, but them on toothpicks and added a thick layer of glossy accents. I used the same colors that I already used for the background - this way the embellishments are not distracting but still add some dimension and interest. Stunning card!!! I LOVE the soft colors and the bold contrasting sentiment! And the placement of the sentiment is SO COOL!!! I honestly can't love this card enough! It's amazing! 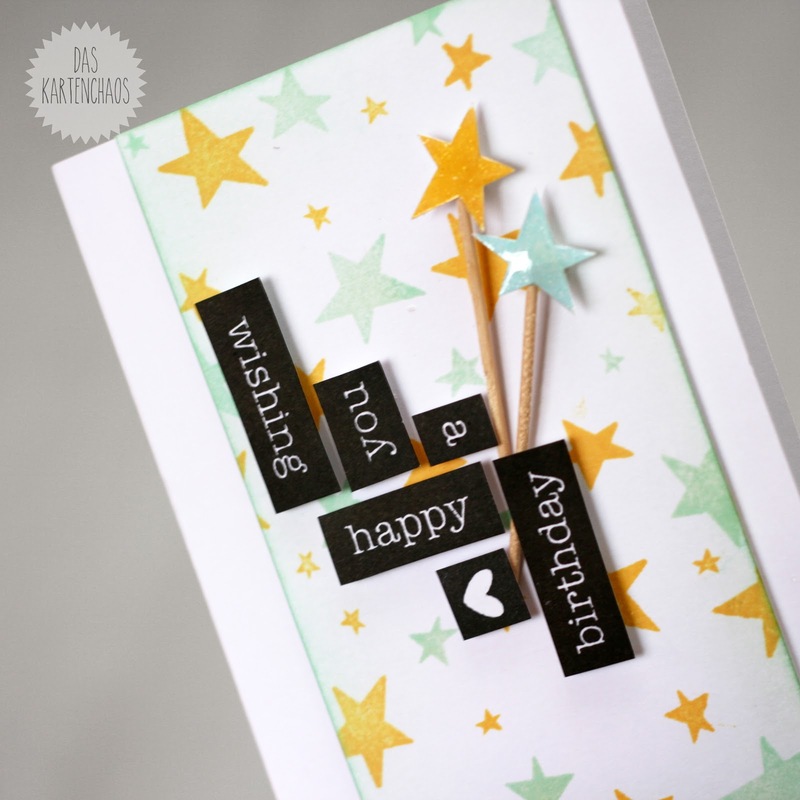 Pretty great card - in love with those stars on the toothpicks with the glossy accents!! They are awesome and I think how you did the sentiment is very clever!! What a fun way to place the sentiment! !Lovely card ! Such a fun and sweet card!!! Love! I really like this card, with the raised matching elements, just fit right in, and look really good!!! And the placement of the sentiment is stunning!!!! I love it. Awesome stamping and design!